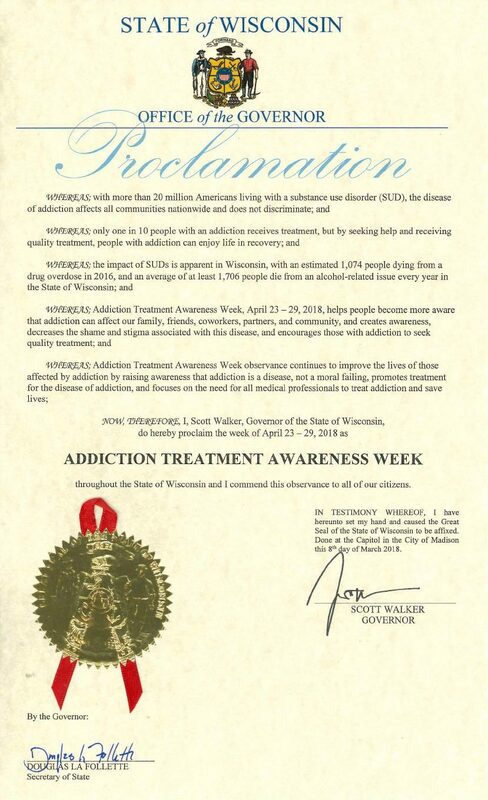 Scott Walker, Governor of Wisconsin, signs proclamation declaring April 23-29, 2018 "Addiction Treatment Awareness Week" throughout the State of Wisconsin. National Addiction Treatment Week, an initiative by the American Society of Addiction Medicine (ASAM), raises awareness that addiction is a disease, evidence-based treatments are available, and recovery is possible. Nearly 20.5 million Americans suffer from a substance use disorder (SUD), yet only 1 in 10 people with SUD receive treatment. An estimated 1.8 million Americans have opioid use disorder (OUD) related to prescription opioids ; 626,000 have heroin-related OUD  with an estimated cost of over $504 billion . Every year in the State of Wisconsin, an average of at least 1,706 people die from an alcohol-related issue. In 2016, an estimated 1,074 people died from a drug overdose in Wisconsin , according to the Center for Disease Control and Prevention (CDC). National Addiction Treatment Week promotes that addiction is a disease, recovery is possible, and more clinicians need to enter the field of addiction medicine. Learn more on how to get involved and spread the word about the need for a larger addiction medicine workforce. 2 Council of Economic Advisers. (2017, November). The underestimated cost of the opioid crisis. Washington, DC: Executive Office of the President of the United States.